Bando 1024 is an extremely stout, powerful sire who owns a great hip and hind leg. This is a bull who should work for the purebred breeder, the commercial man and the club calf producer. Bando 1024 is very deep bodied an wide chested. He should produce some especially tremendous females. Bando 1024 is out of a good Sleep Easy daughter who has great udder quality. Bando 1024 was admired by many in the 2003 show-ring, where he was the Grand Champion Bull at the Fort Worth Stock Show. 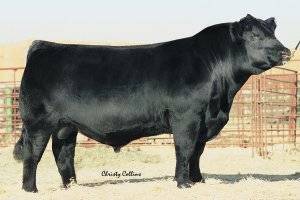 Here is your chance to invest in a great 5175 son who will transmit volume, extra testicle, bone, length and muscle shape.